Delve deeper into the lives of the Disney Fairy friends! 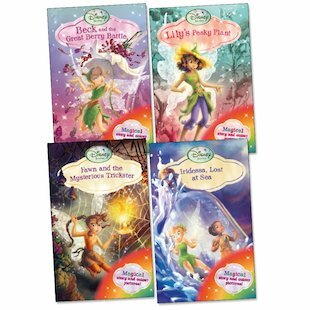 These sparkling full colour novels follow four plucky fairies as they each face their own special challenges. What should garden fairy Lily do with a mysterious plant that stinks and oozes sap? Can animal-talent fairy Beck help when a berry battle breaks out between the hummingbirds and chipmunks? What will happen to prank-loving Fawn when another joker turns the tables on her? And when Iridessa is swept up into an ocean adventure, will she learn that being super-sensible isn’t always clever? Beautiful chapter books with easy-read text and colour pictures all the way through – a must for any fairy fan!